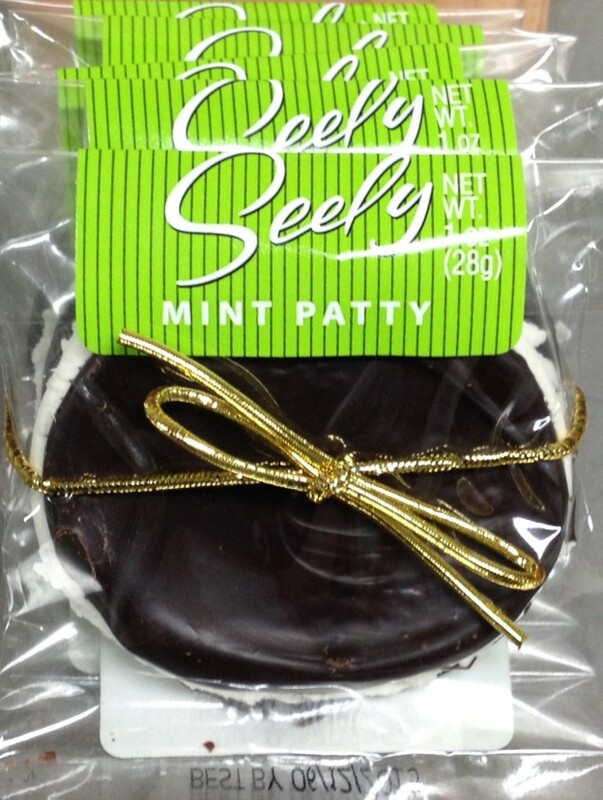 The Seely Mint Patty is by far our biggest success and the reason we are in business today. After people found out how good real mint patties can be when real mint oil is used, they just couldn’t get enough. 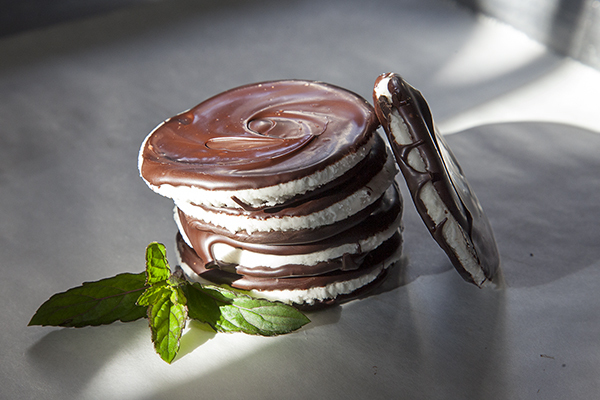 Our Mint Patties are peppermint fondant patties cloaked in rich, dark Belgian chocolate. If you like mint, chocolate, or the combination of the two, you must try some today! You will love its fresh and intense flavor you won’t find anywhere else, because we use pure peppermint essential oils grown in our own back yard. The mint is single-distilled on site to preserve the highest level of freshness. Aside from being a tasty treat, it is also a very healthy one. All of our products are NON GMO (certification pending), gluten free, and made with all natural ingredients including real sugar and agave. For a full list of ingredients, or to order some today, visit our online store. I see that all of your products are GF but I’m wondering if they’re produced in a facility with any other gluten-containing ingredients? We have our own facility and do not produce any products containing gluten. How many calories in one mint patty? Each regular peppermint patty is 130 calories, 30 of which are from fat. What is the nutritional breakdown of one dark chocolate peppermint patty. You can find the nutritional facts in one of the images here. A friend gave me some of these the other day. I haven’t tasted anything quite like these. They are wonderful! We’re always glad to hear people are enjoying our products! Thank you! I live in Oregon City about 12 miles south of Portland, Or. Are there any stores in my area that sell the mints or where can I order them? There are several stores in your area to choose from. Go to this link to find stores near you. If you ever wonder if putting a beautiful picture of mints on the internet will gain new “fans” you do not need to wonder anymore! I have been looking for a “perfect” gift for a dear friend for Christmas and once I saw your ad and read the comments I knew this was the gift! I am on my way this morning to buy Seely Mint Patties for gifts! Thank you! These are the greatest mints in the world. If you think you like jr.mints or peppermint patties even a tiny bit, they will pale in comparison to the first bite of these babies. Holy cow they’re good. Wonderful mint patties! Thank you for making them gluten and wheat free. Can you tell me if the ingredients used are low on the Glycemic index? Fairly low. I believe sugar has the highest impact in our products which is rated at GI 68/100. In Sacramento I guarantee I am the biggest consumer of Seely’s mint pattys. My store consistently runs out of this wonderful treat. Most people can’t afford the cost of these chocolate mints, but I’m addicted to them. I bought the mint pattys last year for my husband and he loved them and said they are the best mint patty he has ever had! I bought more for him this year and he was excited to open the box to five boxes of mint pattys. I will have to keep this tradition going! Thank you for a great and quality product! SO Good!since your label looks as green as Oregon is, why not include the shape of our state somewhere on the graphics to show us to “buy local”. That’s actually a really good idea! We will keep it in mind when we go to print again. Thanks! I’m reaching out from Canada and just came across your products through Export Newsletter. I’m very interested in your products for here in Canada. A few of my buyers are currently looking for a product just like yours! When is a good day and time to connect? I love your Peppermint Patties and it seems that All 3 Eugene Market of Choice stores no longer carry them. 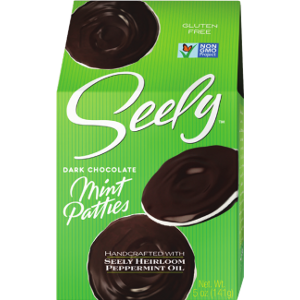 I used to buy the 5 or 6 pack at the Delta Oaks store but today they had tiny Seeley’s chocolate mints, no patties… may I order them online? I purchased my first box of your mint patties last week and saw them listed as gluten free. I worried that they would not be suitable for someone with celiac disease, but see in comments here that they are produced in a gluten free facility. Thank you. I will share them with my mother-in-law who has severe celiac disease. Oh, wait, I finished the box and need to buy more so I can have some to share with her. The mint patties are sooooooo good. I am addicted to them! I go to the store every evening after dinner and buy one (or two!) I can’t buy a supply of them, because I would eat them all. Keep up the amazing work! Love love these peppermint patties! I live in Ottawa do you know if anyone sells them in more quantities than 1 at a time. I can’t believe nobody has commented on this typo yet! I just found these at Whole Foods in Chicago, and they are amazing. Better than any other mint chocolate treat that I’ve ever had. I’m going back to stock up for the holidays. These are absolutely outstanding mint treats. I am a mint fiend but these are the best patties I’ve ever had I went through four boxes during holidays from my Whole Foods (San Francisco but also Fresno). SF doesn’t have them as of today please tell them to restock!!! #obsessed! Found these at Whole Foods before Thanksgiving and me and my entire family are HOOKED! Unfortunately, my WF store indicated that they only carry the mints as a “holiday” item. So happy to have saved my box so I could find you guys online. Best mint patties I have ever had. Seriously. (Did I say #obsessed!) Thank you for making these! Thank you for making them available online! Whole Foods should carry them year-round!